After months of speculation from pros and fans, Steve Yzerman and Hockey Canada unveiled their 25 man roster for the Sochi Olympics. The emphasis of this team appears to be one that can play on both sides of the puck, while still scoring a ton of goals. With a bigger ice, Canada wanted speed and guys who can play in any position they are needed to. Ken Holland, one of Yzerman’s assistants during the selection process, said the group was up until 1 a.m. finalizing the team but they feel confident with the guys they have. Now it is up to Head Coach Mike Babcock to step in to get his players in the right lines and right state of mind to win. This in depth look at the team will start with the goalies. Based on their play last season, two of the three goalies for Canada were locks almost since September. Luongo (16-10-6-3) and Price (20-11-4-2) have backstopped their teams to playoff spots and proven themselves to win big in recent years. With the first two games against Norway and Austria, it is likely these two will both get at least one start. Smith (15-10-8-0) is no slouch himself and Canada has three goalies that can carry the team. Luongo has taken his Vancouver Canucks to game seven of the Stanley Cup final and remained on top of his game even when rumours of trades swirled around him. He is currently injured and the timetable for his return is expected to be before the Olympics, but that could change. But if he’s healthy, it’s a safe bet that Luongo will be Canada’s starter in their first game against Norway. Price has had an up and down career but in recent years, has emerged as a consistent goalie who has stolen more than a few games for the Montreal Canadiens. His .928 save percentage is ranked sixth in the league and second only to Josh Harding among all Canadian goalies. He will probably get a chance to play against Austria, but he will only become the starter if Luongo doesn’t get healthy or plays really bad. Smith was the winner of a very heated debate over the final spot. The third goalie will probably not play, but he does have to be on hand in case of an injury. But that shouldn’t downplay how good Smith has been for the Phoenix Coyotes. He has faced the most shots of any goalie in the NHL, already over 1,000 and he still has Phoenix in the last wild card spot in a tough Western Conference. Team Canada is very deep on forward, but they are also extremely deep on defence. The problem is all of their defenceman shoot right handed. The decision to have four left and four right handed shooters pushed some players down and some players up the list, to what it is now. Before this season, Jay Bouwmeester was far from Team Canada after a disastrous career in Calgary. But paired with fellow Olympian Alex Pieterangelo on the St. Louis Blues has brought Bouwmeester back to being the player that went third overall in 2002. It helps that these two are already a pairing of two big, skilled two-way defenceman and they should play together for Canada. With the Blues, they have combined for 55 points and a plus 36 rating, making them a force to be reckoned with. There are only three defencemen returning from 2010 for Canada; Keith, Weber and Doughty. All were major contributors to the gold medal team four years ago and all have seen their NHL responsibilities increase since then. Keith won the Norris Trophy in 2010 and two Cups in 2010 and 2013. He has been the quarterback of the league leading Chicago Blackhawks this season with three goals and 39 assists so far. Weber lost his defence partner in Nashville, Ryan Suter, to free agency in 2012 but hasn’t lost his touch as a premier defender in the NHL. 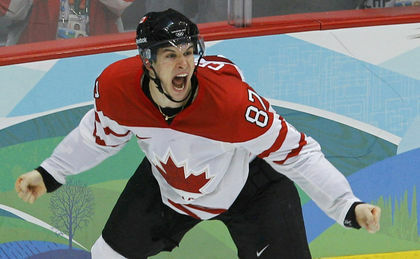 Weber’s past Olympics is most remembered for this goal he scored on Germany. (Video courtesy of r8man on Youtube). Besides his hard shot, Weber is a smart player away with the puck. He has 94 hits and 97 blocked shots this season, so his ability to stop other top players is almost more important than his offence. Doughty has emerged as a premier defender, four years after being the youngest player on the team in Vancouver. Now 24, Doughty will be counted on to be a leader in Sochi and his Olympic Gold and Stanley Cup in 2012 give him plenty of experience to offer. He has been lights out for the L.A. Kings again this year, using his end to end skill to put up six goals and 23 points so far. Two more guys that may have benefited from Canada’s need for left-handed shooters are Hamhuis and Vlasic. Hamhuis plays for Vancouver and his a steady defender who takes care of his end first. Vlasic provides the same stability on the back end in San Jose. I asked Babcock about where he sees them fitting in on his team. But the most polarizing player on the Canadian defence is Subban. The defending Norris winner certainly has the skill and speed needed for Team Canada, but questions about his play without the puck remained right up until the announcement. But he made it, likely because his offensive flare is hard to match and he has worked very hard the past two seasons to improve his game for a bigger paycheck from Montreal and to make Team Canada. Forward is Canada’s most polarizing position and no matter what, there will always be players left off. But Yzerman and his team have assembled a forward roster that is both deep down the middle and full of players who can play in all situations. With seven players returning from Vancouver and all but three under the age of 30, this forward group has a lot of potential and a lot of questions. Rick Nash and Patrick Marleau also played for the team in 2010 but weren’t locks this time. Nash has missed significant time with concussion problems this season and last. When healthy this year, he hasn’t been putting up the numbers he usually does, only registering nine goals and nine assists in 27 games. Marleau has been playing better than Nash, but at 34, he is one of the oldest players on the team and wasn’t invited to the orientation camp in August. He has been offensive with 19 goals and 41 points this season and his leadership will be very valuable. He might even be named an assistant captain. John Tavares leads the next generation of players, joining Jamie Benn and Matt Duchene as the youngest forwards on the team. As the captain of the Islanders, the first-overall pick in 2009 has already emerged as a premier scorer and leader in the league. Last year, Tavares got his team to the playoffs for the first time in six years with a 47 point shortened season. This year he already has 51 points, which is good for third in the NHL. The announcement came one day after he scored three goals and five points in a win against the Dallas Stars. Benn was not invited to the camp this summer but has been one of the biggest surprises this season. After being named captain of the Dallas Stars this summer, he has joined forces with Tyler Seguin to become an offensive force. He has 15 goals and 37 points so far and is on pace for a career high 72, while also playing a strong two-way game. He is also one of the many Canadian wingers who can easily be called upon to take a faceoff if needed. Duchene was invited to the camp but was considered a long shot before the season started. But after he led his Colorado Avalanche to an amazing bounce back from last place, he has earned a spot. Duchene leads the Avalanche with 16 goals and 38 points but was still considered on the bubble all the way up to the announcement. After finding out he made it, an excited Duchene talked to TSN about the pressure that comes with being a bubble player. There were three veteran players on the bubble too, with Jeff Carter, Patrick Sharp and Chris Kunitz all having great years. Carter was an easy addition for Team Canada with Stamkos not guaranteed to play. His wrist shot is almost as lethal as the Tampa Bay star and he has the experience of being on both sides of the Stanley Cup final. Plus, he was the last cut of the 2010 team and has improved his play since then. Sharp is second to only Alex Ovechkin in goals but somehow was not guaranteed a spot. His 25 goals on the league’s top team and his performance in the playoffs helped him move up the ranks. What makes Sharp extra valuable for this team isn’t his chemistry with Toews, but his ability to play all three forward positions and play on both special teams. He will be a player to watch in Sochi. Kunitz was in the same position as Sharp, with questions about his play without line mate Crosby seeming to hold him off the team. With 23 goals and 47 points, he certainly has the stats to play, and it’s very likely he will remain with Crosby throughout the tournament. If so, expect his offence to continue. The final player to make the team was Stamkos, who when healthy is one of the most lethal scorers in the league. But he broke his tibia in early November and while he has been skating, a timetable for his return is still blurry. At best, he will be back a week before the games and at worst, he will miss them. Olympic rules allow Team Canada to make a change up to 24 hours before their first game so one of the many players cut could get the call if he isn’t ready. His quick recovery has been surprising for a broken leg and Babcock addressed that today. Stamkos gave the media an update on his condition after the announcement. With the roster named, all that seemed to remain was who the captains would be. Babcock said they have been picked and will be announced in a couple weeks. “We look at our group and we discuss thing with them and try to have the best leadership group we can have,” he said. “Everybody on this team is a leader and there are some guys who have to lead in their own way, but there are some guys that we expect to carry the mail a little more in that area.” Babcock also said some, but not all of, the players were consulted on the decision. Who did and didn’t make the team will be talked about by Canadian hockey fans all the way up to the first game on February 13th. But Canadian fans should remember one thing, which Coach Babcock made sure to bring up today.